Cors Dyfi Nature Reserve01654 781414work Nature ReserveCors Dyfi is a wonderful little nature reserve that is teaming with wildlife. Over the last few hundred years it has seen many changes, from estuarine salt marsh to reclaimed grazing, then to conifer plantation and more recently into a wildlife rich wetland reserve. Best time to visit - The Ospreys are typically here from April to September - 2019 saw Telyn arrive back from West Africa on the evening of 30th March followed by Monty on 1st April. Spring and Summer are also the best times to see Common Lizards, Nightjars, Grasshopper, Reed & Sedge Warblers, Yellow Flag Iris and Four-spotted Chasers. The Trust’s Water Buffalo graze the reserve during the Summer. The winter brings a host of small birds to the feeders as well as Barnacle Geese and Hen Harriers to the wider reserve. During the winter you may even glimpse the elusive Bittern in the reed beds. Year round we regularly see Otters and Red Kites on the reserve. With the exception of the elevated bird hide, the site is fully accessible to wheelchair users. Facilities include visitor centre with a small shop & basic refreshments; there is a disabled toilet. Assistance dogs only. Until the end of March, the boardwalk on Cors Dyfi will be open everyday during daylight hours - except Thursdays when we are closed for reserve management work. Access is free of charge. The 360 Observatory, the Ceri Hide, toilets and cafe will all be closed but the small tower hide will be open at all times. Please park by the gate as the main car park will be closed. Access is via the two pedestrian gates. 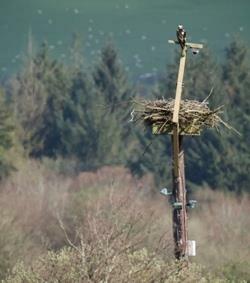 The Dyfi Osprey Project is normally open every day from the end of March until early September; opening times 10:00 - 17:30 (last entry 17:00). 2019 saw Telyn arrive back from West Africa on the evening of 30th March followed by Monty on 1st April. Admission price: Adult £4.00, Children free.